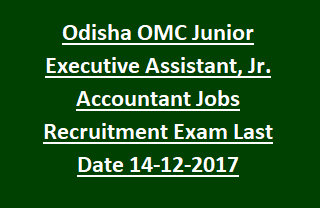 OMC Jr. Executive Assistant Jobs Recruitment Exam 2017: Odisha Mining Corporation Limited OMC welcomes application forms from the eligible candidates for Junior Executive Assistant, Junior Accountant posts. Total available vacancies in OMC Recruitment are 70 posts on regular basis. Eligible candidates of Odisha may go through the OMC notification detailed and apply for desired post using the OMC official website http://www.omcltd.in. Online application process starts from 15-11-2017 to 14-12-2017. Candidate should have age limit between 18 years to 32 years as on 31-10-2017. Mode of selection for OMC Recruitment vacancies is based on written test and followed by Computer Proficiency Test. Based on the Educational qualifications and Post Experience candidate will be shortlisted for written test. Pay Scale for selected candidates is Rs. 5200/- to Rs. 20,200/- per month plus GP of Rs. 2800/-. See the below given details of Application procedure, Age limits, Pay Scale, Educational Qualifications, experience details of Odisha Mining Corporation Limited OMC Junior Executive Assistant, Junior Accountant Recruitment Notification 2017. Vacancies available in Odisha Mining Corporation Limited OMC Recruitment are 70 posts. Jr. Executive Assistant: Degree in any discipline with Diploma in Computer applications/ PGDCA. Candidate with MCA, BCA, BSc (IT), BSc (CS) qualification need not require DCA/ PGDCA certificates. Jr. Accountant: Degree in Commerce from any recognized University. Age of the candidate should be not below 18 years and above 32 years as on 31-10-2017. Selection of candidates for OMC recruitment is based on written test and Computer Proficiency Test. Candidates will be shortlisted for written test based on their qualification marks. Short listed candidates will be called for documents verification, written test and followed by Computer Proficiency Test. Eligible candidates may go through the OMC notification detailed and apply for desired post using the official website http://www.omcltd.in. Upload scanned copy of required documents such as date of birth, qualification certificates from HSC/ 10th class onwards, marks certificates, Experience certificates, signature, Photograph etc. with the application form from 15-11-2017 to 14-12-2107.